Appropriate extraction systems improve productivity, protects products, and prevents accidents, but it is important to get it right. PremiAir can advise on all types of Extraction, ventilation and cooling systems including evaporative cooling systems saving you money, energy, and disruption. A simple phrase and one which many just pay lip service. But! What if you could increase your bottom line by just 0.5%, what would that mean to your business? Would it be worth the investment in ensuring that your staff have the best environment to work in, thus increasing their productivity? Potentially less sick days, less lethargy within the workplace providing a brighter healthier environment. Depending on the industry you work in health and safety requirements may be a legal obligation. If you would like to know more and see how this may affect your business, please get in contact with us. With pollution levels being the highest they have ever been and continue to rise coupled with poor ventilation can cause numerous health problems such as headaches, asthma and rashes. PremiAir’s commercial ventilation can reduce all of these effects by keeping your work area well ventilated. Ventilation systems use very little energy and correctly used, a warm air heating system can easily be the most efficient system type available. They can be further improved with the proper use of intelligent controls and destratification fans. Ventilation systems can be combined with heating or air conditioning, but because that will add to the work the main system has to do, extreme care is needed. We are here to advise to ensure you get the ventilation system that is right for you. How comfortable occupants will be using a warm air heating system will depend on it’s correct design and the nature of the building. If temperature is not the prime concern, or if the majority of your heat is generated inside the building, ventilation systems can significantly improve comfort levels by increasing oxygen levels, removing locally generated heat, and creating air movement. By calling PremiAir, you’ll be sure to receive expert advice. In most industrial applications, a warm air heating system will be the lowest cost option, but of course it’s important to know that you’ll also get the results you need. At PremiAir, we can give you a full assessment so that you can compare value for money, not just price. 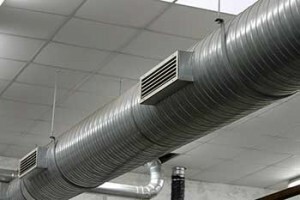 Provided that the space to be ventilated is close to the outside of the building, a ventilation system can be very low cost to install and may provide the lowest budget solution to an overheating problem. Here at PremiAir we have years of experience dealing with industrial & commercial heating systems. We’re determined to breath a breath of fresh air into your experience of contractors, and change your perception of how they work for the better. Read on below to learn how we do that. Premiair offer heating, cooling and ventilation systems benefitting from guaranteed prices, high quality workmanship, and minimal disruption. If you would like a free consultation please complete the form or give us a call to discuss your requirements we will be happy to help. PremiAir is the leading designer, supplier and installer of ventilation, heating and evaporative air cooling systems to industrial and commercial clients in the UK. Please click on the service below that interests you, to find out more about how we can help you.